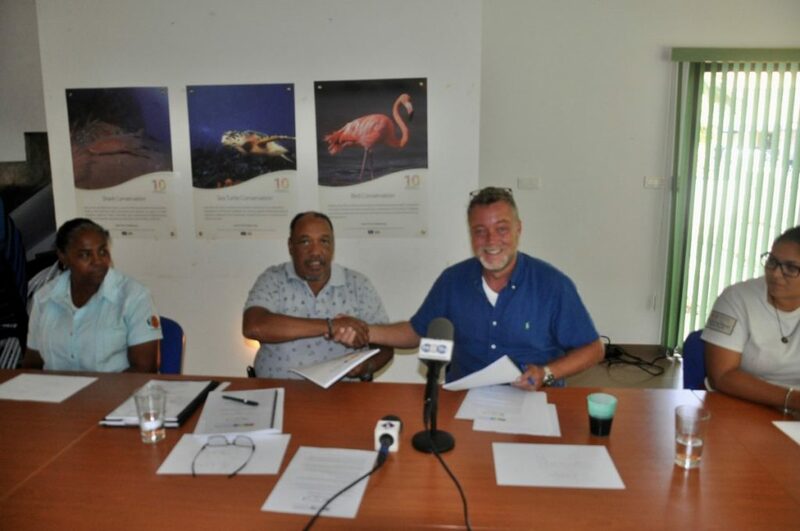 Kralendijk – The parties involved in the collective labor negotiations for STINAPA staff, the board of STINAPA and the Fedebon Union have reached agreement on the employment conditions. The collective labor agreement (CLA) was signed with a festive touch this afternoon. Gerold Bernbela, chairman of the trade union, said he was very pleased with the result achieved. “We are very pleased with the fact that we as a trade union, together with our shop stewards within the organization, have been able to achieve this result”, according to Bernabela. According to the trade unionist, the collective labor agreement provides security for the employees of the nature organization for a longer period. STINAPA director Arjen de Wolff is also quite pleased. “This CLA guarantees fair payment for honest work. In addition, agreements were also made about the further development and growth of our employees. As a result, STINAPA can provide better work as an organization and better meet its objectives, “said De Wolff. The STINAPA director was also full of praise to the negotiating parties. “I thank the Fedebon, our employees and our board for the dedication and the result achieved”, said De Wolff. The negotiation of a collective labor agreement for the employees came after STINAPA employees had ‘en masse’ left the ABVO and also made a collective switch to the Fedebon. The result achieved provides for the annual payment of a 13th monthly salary, 8% holiday allowance, an official day off at the Dia di Rincon and certain reimbursements in case of illness or other medical costs. Unique for Bonaire is that male employees, in case they become a father, are granted a fatherhood leave. The collective labor agreement has a term of 5 years, so that in the coming years there will be at least some rest when it comes to the relationships between the employer and its employees.